Some sort of modulated sampling/trigger jitter problem at 5 microsecond intervals (the "5us jitter problem"). And severe jitter with the AC coupled trigger mode, a problem which is also present on the DS2000 series scopes as well. NOTE: So many people have been confusing AC trigger coupling with AC input coupling people will be more familiar with. This issue has *nothing* to do with AC input coupling, it is AC trigger coupling! Just checked, I have the same AC trigger problem with my DS1054 that shipped last week. 5us seems fine here. As I said on EcProjects video, my DS1074Z from spring this year does not suffer the 5us trigger problem. I measured a 25MHz oscillator, so if it would be a beat frequency you may see the same thing at 4us (-20% period).. nope nothing there. I still run v2 firmware (SP5). That firmware version doesn't show the board version, but I assume it's a very early-on model. It seems like the AC coupling issue is also present on this older firmware version. The LFR does the same thing. edit: The internal function generator does the same, so it's in the scope AC triggering. The artifact changes with frequency quite drastically, but even at 5MHz the triggering is very jitterish. I have recorded the frames using the record function. The "jitter" on this image repeats every 8 cycles (coincidence 2^3?). The first 3 frames are clean. On the 4th the waveform jumps 3ns to the left and gets progressively worse over 5-7 frames. On the 8th it jumps back. This repeats on and on.. I also noted that the LFR/AC does not have a trigger level pointer next to the screen side, but it does show a "voltage" in the right hand corner. What is that all about? It seems like the AC-only triggering is off by quite a bit. Are either problems affected if your signal is properly terminated? Especially the AC triggering - I can easily see how adding an extra capacitor could cause... well, anything! What do the settings on the Rigol generator mean? The way generators specify offset varies. Is 5V p-p with 0V offset a +2.5V to -2.5V square wave? 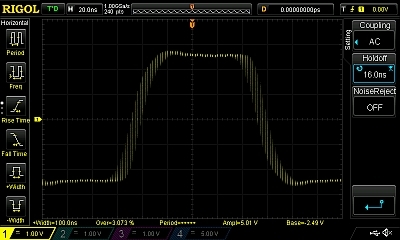 The graph the the bottom of the screen has a faint line at the top of the square wave like that might be the 0V indicator. If it is, I am not surprised the scopes mistrigger when switching from DC coupled triggering to AC coupled. What I can see is that the trigger drifts away. There are several good triggers, and then it snaps out by quite a bit and creeps up. After a few frames it jumps back - although that seems to vary now unfortunately. It also occurs when I pick a large timebase (1us/div) and then zoom in. Even with a trigger holdoff of 1s it jitters. If I change the impedance of the Rigol function generator to HighZ or 50 ohm it does not make any difference to the glitch I have displayed. Amplitude 1V and offset 0V on my signal, so the signal swings +/- 500mV. Could very well be a digital problem because I recall from some source that the triggering is all-digital in these Rigol. Although I was using the internal 1kHZ square wave. On Dave's video it looks like the jitter is discrete, i.e. only a finite number of separate timing positions. This would match what hans observed. What I also think I am seeing is that the number of discrete positions is twice as high on the 2000 series scope than it is on the 1052z series scope. At the same time, the difference in maximum sample rates is also factor of 2 (2 GSa/sec vs 1 GSa/sec). All this for me points to a digital (FPGA) issue. AFAIK the Rigols interleave several ADCs to get the maximum sample rate. Maybe the FPGA or firmware messes up the phases to the ADCs (or uses incorrect cal values for the phases) so their alignment is off? Gut feeling tells me that the 5uS jitter issue is a hardware problem, most modern scopes take a 10 MHz signal then multiply it up using PLL chips and I think we are seeing a PLL problem here. There is something about ADC scopes and jitter that I have yet to conquer. I have a Picoscope 3000 series and the jitter on that was so bad that I built my own separate trigger circuit and fed that into external trigger. Dave, your function generator should have a sync output or something like it. What happens when you drive a Rigol scope off an external trigger? Edit: seems I didn't check thoroughly enough, see below. I can't reproduce either errors on my DS1074Z-S (Software version 00.02.03.SP5), by using the internal Function generator. Can't reproduce it on my DS1104Z with 00.02.01.SP1 firmware. Trace is slightly noisy no matter the offset, but that probably the source. Only difference is I don't have a FG capable of 20Mhz, if that makes any difference! 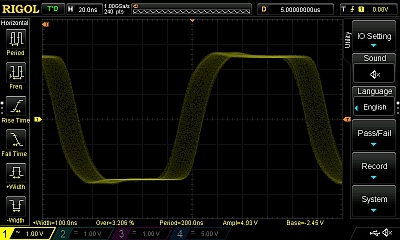 Edit: Tried again with a proper function generator (less noise) at 2Mhz and could not reproduce it. I'm not 100% familiar with my DS2072 as it's my first DSO (Used only CRO's) Using the internal square wave can someone tell me the quickest way to check this. Did you look at the trigger-out? Shouldn't happen, but I can't see this being a deal-breaker given the general performance and value for money. Neither do I with my DS1054. But I found something else I can do with the internal function gen: freeze or crash my scope. Can't really figure out how to reproduce. What I did was inspecting the internal 1kHz function with AC triggering, occasionally zooming in and out (pushing things to the limit basically). Finally, when I tried to display the pulse width the scope crashed. The first time I did this I saw some kind of junk on the display, just random pixels. (I actually have seen that before- and I only have it for a week now.) It didn't react to any inputs either. I rebooted the whole thing and tried to reproduce the error. No junk on the screen this time but it did freeze again. Maybe it's just my particular scope but I'm curious though if anyone else has experienced these kinds of problems. Signal is a 5MHz, 5V P-P square wave from a Rigol DG1022U. 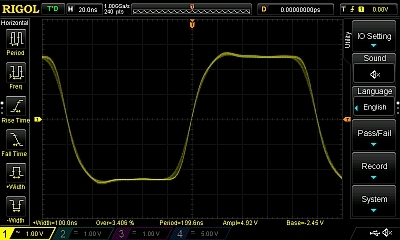 20Mhz, square, 5Vpp, AC/DC coupling has no effect. I see none of the 2 problems the trigger AC cooupling jitter issue on my DS1104Z-S, using the internal sig gen.
No mention of hw version. on Monday I bought an older Instek 2202, but almost went for a Rigol; i'm so glad I didn't get a Rigol!! I'm sure they can fix this with a FPGA update. The DS1054Z doesn't have a trigger comparator, so they have to do all the triggering on the acquired data, which works surprisingly well. (Wondering what happens if you turn on all four channels). For AC triggering they have to digitally highpass-filter the data before finding the trigger instant. I guess they messed up the filter. The 1052E uses a classic analog trigger, so they don't have this issue. Is it possible to downgrade the firmware on the DS1000Z range? Or is the firmware version bound to the hardware version? AC or DC coupling doesn't seem to make any difference.